Fermented foods are popular all around the world, and people enjoy all kinds of these beneficial foods, from sauerkraut and kimchi to kombucha. Fermented foods have in fact been through a process of lacto fermentation in which natural bacteria feed on sugar and starch in the food and produces lactic acid. This process preserves the foods and leads to the formation of various probiotics, beneficial enzymes, and B vitamins. The consumption of fermented foods, as they are high in probiotics, brings beneficial bacteria into the digestive system and maintains a balance of the bowel health. Therefore, the digestive enzymes function better in absorbing food. Probiotics also support the production of antibodies and strengthen the immune system, preventing various illnesses and diseases. 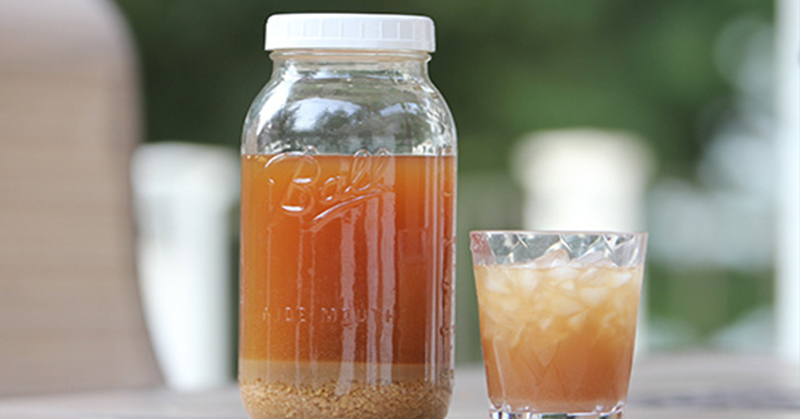 Ginger is a common ingredient in fermented foods, due to its beneficial properties. It effectively soothes inflammation, treats various diseases, and even fights cancer. Its main bioactive compound, gingerol, has powerful anti-inflammatory and antioxidant effects. Moreover, ginger treats various other ailments, like nausea, reduces high blood sugar, lowers heart diseases risk, and lowers the levels of LDL. You should put the ginger in water to soak for 15 minutes. Then, scrape the skin off with a spoon. If you have a small jar, the ginger root should be about the size of your hand. Then, add the lemon juice and make sure it covers the ginger completely. Next, add the turmeric and sea salt and wait until all is dissolved. Pour it all over the ginger in the jar and close it up air tight. You should leave it to ferment at room temperature for 2 weeks. To enjoy the benefits of the lacto fermentation, you should not cook them, but just serve them on the side of a dish. Add the sugar to the water, which should be at room temperature, and it will dissolve easily. Then, add the other ingredients, cover with a cloth, and secure with a rubber band. You should keep adding all the ingredients listed above on every 24 hours and do not remove anything. Stir occasionally to make sure it is aerated, and after some time, you will notice bubbling. You should check often to be sure that nothing is growing inside the container. Within a week, the ginger bug will be ready, and you can add it to a glass of water and consume it as a stomach settling remedy.